The hosts finished 175 runs ahead on day three, after Kohli's 25th Test hundred got India to 283 runs. 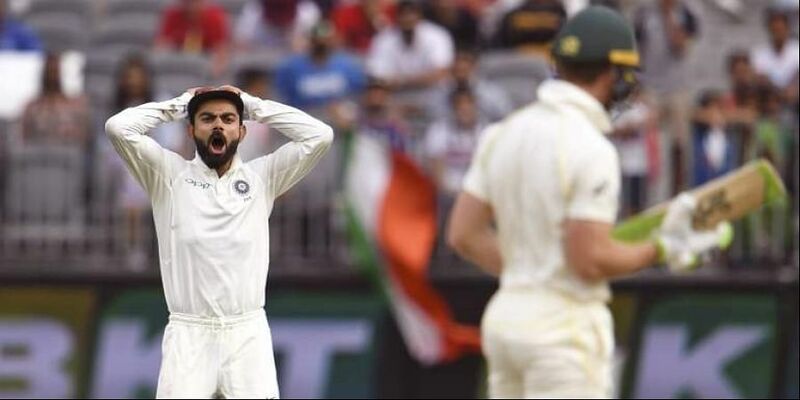 PERTH: Tensions flared-up towards the end of day three with none other than the two captains, Virat Kohli and Tim Paine, exchanging verbal volleys as the second Test between India and Australia headed for a nail-biting finish. The hosts finished 175 runs ahead on day three, after Kohli's 25th Test hundred got India to 283 runs. The Indian skipper was out caught at second slip, and while the catch was referred to the third umpire, it wasn't overturned on account of soft signal. It led to quite a talkative Kohli on the field during Australia's second innings, which carried on until stumps, with both captains exchanging words. "If he messes it up, it's 2-0,"Kohli said, which was picked up by the microphone after he and his teammates made a loud caught-behind appeal for Paine in the final over of the day. The Australian captain did not hold himself back and replied "You've got to bat first, big head". The hosts star-spinner Nathan Lyon, however, played down the incident. "I think Tim just asked him where he was going for dinner that's all. I've played enough cricket against Virat to know what he's like, and I'm not worried about what he's doing or what India's doing," said Lyon. "Virat is a great player, he plays on emotion, we all know that, and to be honest I'm not too concerned how Virat reacts or the way he conducts himself. I'm just worried about what we can control in the Australian dressing room and I thought as bowlers we came out today and performed pretty well," he said. Kohli was his usual animated self but his on-field antics did not go down well with former Australian players Mike Hussy and Allan Border. "Kohli is out of control ... I don't like his attitude at the moment," Hussey was quoted as saying by Macquarie Sports Radio, while former captain Border told Fox Cricket: "I don't think I've ever seen any captain carry on like that." With India batting last on a tricky surface, chasing anything above 250 will be a big ask. Lyon said: "The wicket seems like it's starting to play a few more little tricks. We were expecting the cracks to play a little bit more, but with that rain yesterday it probably softened our ball up quite a fair bit. I know as bowlers the ball in cricket terms felt like it had no air left in it, so it lost a little bit of zip off the wicket. "But we were pretty happy with the way we bowled and we know that come the second dig we can bowl much better than that. So we can take a few lessons off that first innings," he added. Opener Aaron Finch had retired hurt after being hit on his finger by Mohammed Shami in the 13th over. Scans later cleared him of any serious damage on his right hand's index finger. Lying said Finch had been cleared, but was unsure if he would bat again in the second innings. The spinner had taken 5-67 in the Indian innings, his seventh five-wicket haul against this opposition in Test cricket. When asked if India had made a mistake in not playing a full-time spinner, Lyon replied, "yes!" "I thought we were well off in the first innings of this game, so to bowl India out for 283 was a pretty good effort especially when you've got someone who scores a big hundred. "So it gives us a lot of confidence that we weren't at our best and we were able to take 10 wickets for 280," he added.